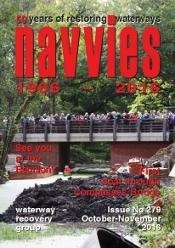 Subscribe to Navvies magazine or renew your subscription. Published six times a year, each issue gives full details of forthcoming workparties and progress reports from all over the country. An interesting, useful & entertaining read! The subscription cost is kept artificially low so that everyone can afford to subscribe. If you can make a donation in addition to the minimum subscription, this is always appreciated. To make a donation add your 'Navvies subscription' to the basket, then view your basket before checkout. In this window you will be given the option to make a donation to WRG.